On some level, the latest DreamWorks CGI project isn’t a movie so much as a gag-delivery system wrapped in special effects. The story is crammed with incident, yet completely trifling; there are a ton of personalities, but no real characters. It zips along at hyperspeed, alternating jokes, explosions, and videogame-ready action segments, but never comes to rest long enough to make an impression. It’s available in some markets in 3D, but regardless of presentation, it’s strictly two-dimensional. But for all that, it’s pretty good fun while it lasts. Story-wise, Monsters Vs. Aliens doesn’t go far past its ’50s-drive-in title. It starts with a naïve bride-to-be voiced by Reese Witherspoon getting exposed to an alien element called “quantonium” and growing to immense size; the Army quickly shows up to take her in hand, and she wakes up confined to a creepy high-tech government prison, where she’s informed that her new name is “Ginormica,” and along with her fellow monsters (a goofy crew voiced by Hugh Laurie, Seth Rogen, and Will Arnett) she’s been Area 51’ed out of existence. But shortly thereafter, a giant alien robot shows up to harvest the quantonium, and the desperate government has to sic Ginormica and her new friends on the harvester and its master, a big-headed tentacled alien with the voice of Rainn Wilson and an eerie resemblance to Squidward on SpongeBob SquarePants. The story often seems driven less by plot necessity than by a desire for equal time for the celebrity cast; Stephen Colbert gets in some laugh-worthy deliveries as America’s blowhard president, though scenes involving him and Kiefer Sutherland’s Army general (who bears the Looney Tunes-worthy name “General Warren Monger”) drag on and stall the action. The banter between the monsters, Ginormica included, is generally clever and snappy—no surprise from a stable of screenwriting vets from The Simpsons, The Larry Sanders Show, King Of The Hill, and Kung Fu Panda—but even the protagonists are largely superfluous excuses for sight gags, one-liners, and guaranteed-to-age-badly cultural references. And the 3D alternates between impressive use of vertigo-inducing depth, and cheap shots like a guy repeatedly bouncing a paddleball at viewers’ eyes. 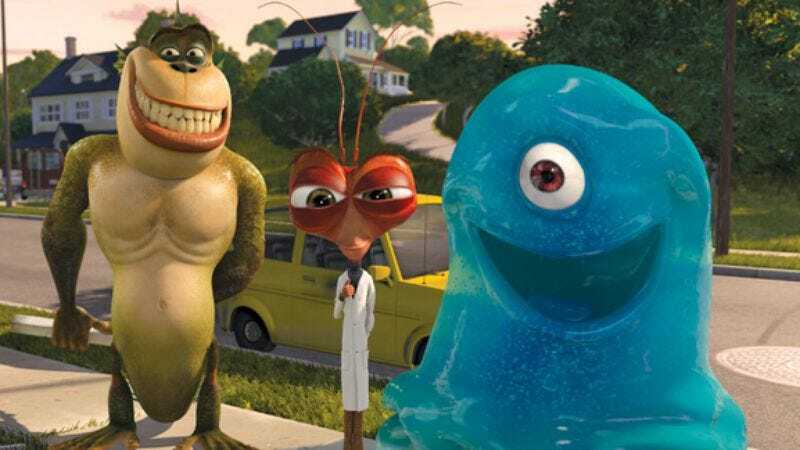 That latter moment sums up Monsters Vs. Aliens: It’s lively and even dazzling, but it’s also more than willing to lazily distract its audience rather than trying anything new.